Life is coming along quickly. So quickly that I'm having trouble keeping track of the days. I'm sure that happens to you also. Did you know that it's February 21? It has been all day and I'm just shaking my head at the fact that it's past the middle of February. Already! Good thing I have a calendar to remind where I am and where I need to go. Last week was my mom's birthday. She turned 71. I don't think she'll mind too much that I'm sharing that news. 71. The great thing is that she doesn't act like I thought a 71 year old would - and definitely in a good way. One of my mom's greatest traits is her willingness to do whatever is asked of her. Embrace the world. When I was younger and our family would go to amusement parks she was always the one ready for the scary rides. The last time I was at an amusement park with her she still was up for the crazy rides. I can't remember if that was 5 or 8 years ago. 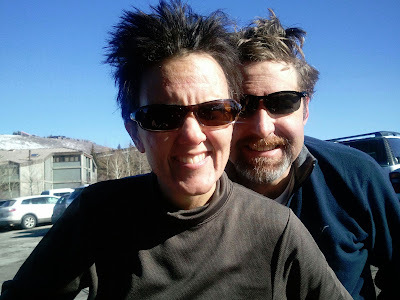 I invited her to go tubing with my family at Soldier Hollow for her birthday last Friday. She was all over it. Yes, she was nervous. A bit worried about getting on and off the tubes and would we be able to stop. I wish I could say those worries never crossed my mind but they did. What would my siblings do if I let my mom get hurt - I'm pretty sure I would NEVER live it down. Anyway, tubing was awesome. My mom was awesome. No one got hurt, except maybe my throat from the thrill of screaming down the hill. One of my daughter's friends told me that my girls and I have too much confidence. I don't think that's quite true but I do know that I am fairly confident that I can do most anything. I know that not everything I do will turn out great but I will try just the same. I think Brian and I have done a pretty good job instilling that in our girls. Sometimes I forget that that confidence gift is from both Brian and me, not just Brian. Then I need to remember where I got that gift from. I'm sure it came from both my parents but when I look back at my mom's life I can see how that quality has always been one of hers. She has never doubted that I could do anything asked of me and has been a great example of living with confidence. Bahahaha! Love the hair. I did need a laugh. Thanks for updating your blog. I love hearing about what you and your confident girls are up to these days. It makes me want to blog again. You always have been an inspiration!